Mark Richt, head coach of the University of Miami Hurricanes, has been named the Walter Camp 2017 Coach of the Year. The Walter Camp Coach of the Year is selected by the nation’s 130 Football Bowl Subdivision head coaches and sports information directors. 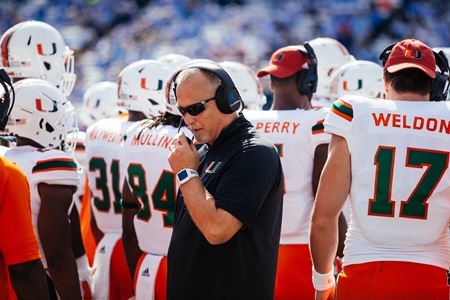 Under Richt’s direction this season, the Hurricanes have recorded a 10-2 record, won their first-ever ACC Coastal Division title that earned them a berth to the league’s championship game. Miami’s 10 wins this season are the most for the program since 2003, and the Hurricanes’ seven league wins were their most since joining the ACC in 2004. In addition, ten Miami players were recently honored as All-ACC selections, and Richt was named the league’s Coach of the Year. The Hurricanes currently hold a No. 10 national ranking in the College Football Playoff poll. Miami will play Wisconsin in the Capitol One Orange Bowl on December 30. It will be Miami’s first appearance in a New Year’s Six game, which began as part of the College Football Playoff in 2014. In two seasons as Miami coach, Richt holds a 19-6 record and is 164-57 in 17 years as a college football head coach. His .744 winning percentage ranks as the seventh-best among current FBS coaches with at least five years of experience. Richt attended Miami where he played quarterback from 1979-1982. Following graduation, he served as an assistant coach at East Carolina and Florida State before spending 14 years as the head coach at the University of Georgia. He was named head coach at Miami on December 4, 2015. Coach Richt, along with the members of the 2017 Walter Camp All-America team and other major award winners (Alumni Award-Eddie George; Man of the Year-Calvin Johnson; Distinguished American-Lee Corso), will be honored at the organization’s national awards banquet, presented by David McDermott Lexus of New Haven, on Saturday, January 13, 2018 at the Yale University’s Lanman Center.